The first thing to deal with on this wonderful Friday morning is this weekend's Pittsburgh Mountain Bike Fest. If you happen to be anywhere near Western PA, then by all means, find a ride that fits your schedule and make it happen. Further afield, there is a race taking place in France this month, and I guess it's basically impossible to avoid making mention of it here. 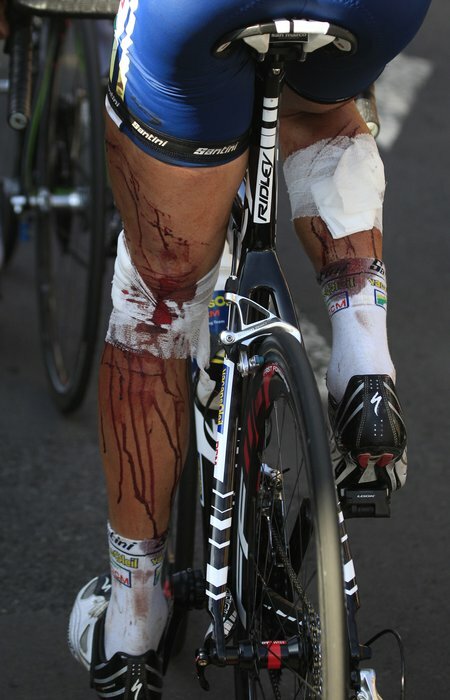 As I have mentioned before, its hard to relate to the athletic demands and the spectacle that is the Tour de France. I would have a very difficult time just riding my bicycle for 150 miles; I simply cannot imagine the strength necessary to race that distance, everyday, more or less, for three weeks straight. If you can strip away the politics, the drugs, the drama of team personality clashes, the dominion of sponsor hegemony, and the Euro haircuts, the major tour races really are absolutely amazing on a very basic level. Anyway, concerning the 2011 version of the tour, if you are a fan of the crash reels included in most full length action sport videos, or youtube clips that include the word "fail" in the title, then you owe it to yourself to check out some video of the tour this year. There have been so many spectacular crashes that its hard to focus on the achievement of 18 stage wins. Using just one example, Johnny Hoogerland careened off road after a horrible car-on-bike crash, flipped, knocked over a fence post, and was severely lacerated by barbed wire. Then he got back up, got a different bike and new shorts and rode another 40km to the finish. Unbelievable. Because I was unable to reconcile my French travel plans with the frantic demands of my work load at Rigid Bicycles this summer I will not be personally attending any of the 2011 Tour de France. However, I am still motivated to expose my sons to the very best in cycling athleticism, so, this past weekend, I took them to see a BMX race. We had a great time spectating and followed it up with some pretty sweet singletrack mountain biking nearby. For those who have never attended a big BMX race, the racing was thrilling to watch, the event was well attended, there were recreational vehicles scattered everywhere (big street legal movable houses--not little four wheelers, or dirtbikes), there were tents aligned in a mysterious grid that resembled a redneck refugee camp for outcast 1980s metal video extras; there were corndogs, and there were hundreds of children, boys and girls, darting through parked BMX bicycles whose individual values were likely well over that of my automobile. It was a blast. One word of caution, however: if you were not aware by now, the bright neon color schemes from the 1980s are now furiously back in style again. The NBL BMX Nationals is a nationwide series and if you happen to be within easy driving distance of an upcoming event, I seriously recommend checking it out. The race inspired me to check out some bmx magazines from my childhood days, to search around on the intertubes a little, and to get just a bit nostalgic for the days of matching pad sets, mouthguards, and the band Ratt. So for your entertainment, here is a video of the the 1984 version of one of these events. Although this video is seriously exciting to me, I realize I will lose most readers with this one because the video is about thirty minutes long, which is the online equivalent of a five hour double-header at the drive-in. NBL BMX Grand Nationals 1984 from Union Street on Vimeo. If you made it through that I congratulate you. There were nearly as many crashes in that film as this week's stage 9. Finally, in a further effort to regain my lost youth, I will be getting into some mountain type bicycle riding this weekend for the PTAG mtb fest; if you live close and want to link up, then you know what to do. If you live far and still want to make contact then keep the mailbombs to yourself.